Now Available Memorial weekend through October. We are in Ventura Country Club. It is a gated golf community just 10 minutes north of the airport. The complex is about 500 acres and has a club house and restaurant. It is quiet but, just minutes away is all of Orlando to explore. Only 30 minutes to Disney, Universal, and SeaWorld. About 45 minutes to beach and Kennedy Space center. We have 2 bedrooms one with a king-sized bed and an en-suite bathroom. The other bedroom has a day bed that can be made into a king bed or 2 twins. The heated swimming pool is just across the driveway and it is a hotel style pool with tables and lounge chairs. We also have free Wi-Fi and cable. We have 55 inch flat screen tv in the living room and a 43 inch flat screen in the master. All linens including beach towels are included. We also have a desk and a wireless printer so, if you need to work........you can. Tim and Karen are avid travelers and stay in Florida during the winter and Wisconsin in the summer. We own Chocolate City Travel and have visited over 25 countries. We rent the condo out when we are not in Florida. We love Orlando. There is a lot to do besides the theme parks. Tim is also involved in the Horticulture industry (sales). It is in a gated community and right on a golf course. Close to airport, Disney and Universal. Free Wi-Fi and Cable. It is in a gated community where it is quiet and safe. We are close to many restaurants, grocery stores, and malls. Great golf course and great view of 18th tee from our screened in porch. We also have a desk and a wireless printer. So, you can work from the condo if you need to. Close to Disney, Sea World, Universal and on an 18 hole golf course. Close to both the east and west coast. The air is always the best price coming into Orlando. Our condo is on the second floor overlooking the 18th tee. We have internet and a desk with printer. At the clubhouse they have a fitness center that is included with rental. New stainless dishwaser installed this year. ** Just remodeled the kitchen** Quartz counter tops and new white shaker cabniets. Plenty of pans to cook with. Baking dishes are also available. We have 2 tables. One is a round table that seats 4 and the other is acts as an entry table but will convert to a dining room table that will seat 8. Some call it a Lanai......we call it a screened in balcony overlooking the 2nd tee. We call it a balcony. 18 hole golf course. You can play as a member. Ventura Country Club. You can check out their website. Willowpointe has their own heated pool. Just steps away from the condo. We are within 30 minutes of Disney, Universal, SeaWorld, Kennedy Space Center and Cocoa Beach and Ron Jon's. Kitchen totally renovated Nov 2018. Clean and quiet. Just what we needed for our trip. This unit is clean and has a lovely quiet back balcony overlooking the golf course. 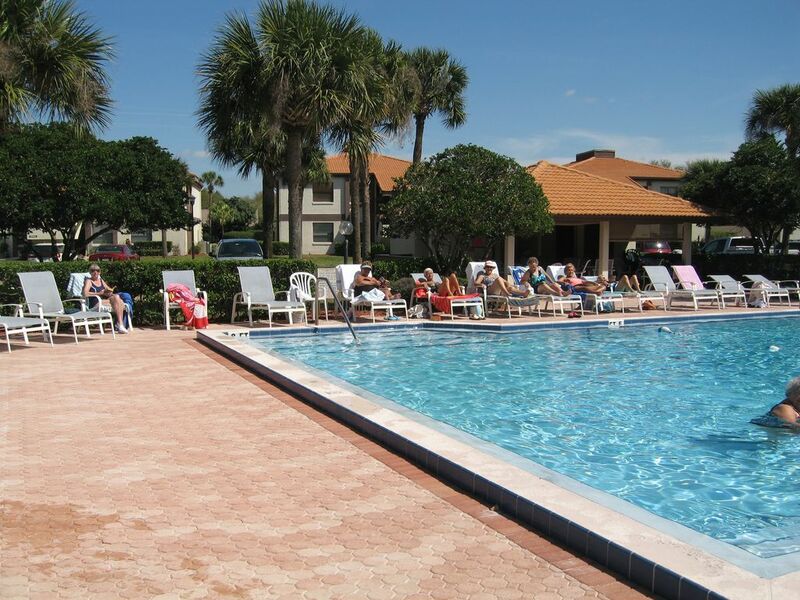 The community pool is right across the parking lot and all residents were friendly and accommodating. Wonderful and affordable. Thanks for your input! Glad you had a good vacation!! Thank you!!! Enjoyed having you. The condo was very clean and nice. If you enjoy watching golfers, this is the condo for you. The lanai is overlooking the 18th hole. The environment was very quiet and relaxing. Pool is just across the small Parking lot. Gated community. Very secure. The neighbors in the 4 plex were so friendly!! Karen, the owner was too! If you want the noisy, unfriendly atmosphere of a big resort don't come here but if you want the opposite this is the place. Close to shopping, Universal studios etc. I will certainly come back. Thank you very much. Come back anytime!!!! I spent four weeks at this condo and I don't have a single complaint. I was in Orlando for a month completing some graduate school work. The condo is quite spacious and has a beautiful view of the 18th hole of the golf course. It was very clean and provided all the accommodations I was looking for. The neighborhood provides many amenities and had great security. The pool is right across from the condo; and although I didn't use it, it looked very nice. The condo is conveniently located in the middle of Orlando which makes it a nice place to stay to see all of Orlando's attractions. The highways are nearby making it easy to get around this large city. Karen and Tim were absolutely amazing. I had the misfortune of having Hurricane Matthew pass by Florida while I was staying here. I am a Florida native but it is quite frightening to have a category 4 hurricane heading your way. Since the hurricane wasn't initially projected to hit Orlando, Karen was nice enough to allow my family to come up and stay with me from West Palm Beach to ride out the storm. Thankfully nothing happened but that gesture alone meant a lot to me. I would gladly recommend this place to anyone and hope to stay there again in the future! Sorry, I am so late in thanking you for this review. Glad we could accommodate the "whole family" during the hurricane. We are about 10 minutes north of the airport in Ventura country club. It is a great location for anything you would want to do in Orlando. We are in a gated golf course community so, it is safe and quiet. We are close to a lot of places to eat and only 30 minutes to Disney, Universal and Sea World. 45 minutes to Coco Beach and Kennedy Space Center.